“Mommy, that little girl looks like me,” my daughter says, excitedly, tugging my arm to get me to turn my head as we cruise down the aisle of Target. A cute black girl with a halo of tight curls is featured on the signage in the girls’ department, decked out in a brightly patterned outfit that my daughter would definitely wear. She’s seeking that representation everywhere. Representation matters. Nothing will grab my daughter’s attention faster than seeing a young black girl with big natural hair. My daughter has big, big hair with perfect curls. It’s all I can do not to be jealous when we sit down to wash, condition and style her hair every Sunday. I’ve spent a good chunk of her life trying to instill in her that her hair is beautiful, that it is magic and she is lucky to have it. I’m thankful to Dove Hair, which not only offers products specifically for different curl patterns with its Quench Absolute line, but now the company has also started a conversation about curly haired representation. 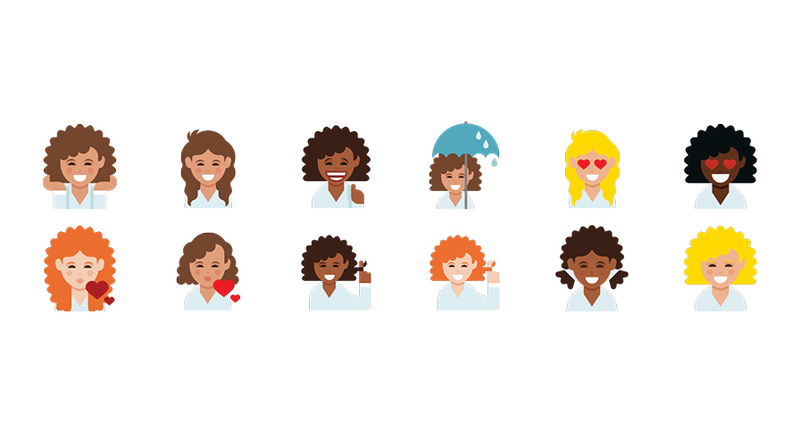 Their new #LoveYourCurls emojis (and GIFs) literally add curly hair to the conversation. These emojis can be used in all text and messenger apps (i.e. iMessage, SMS/text, Facebook messenger, WhatsApp, etc. ), addressing what has been a crazy oversight all these years. Three out of five women say they cannot accurately depict how they look using emojis—in 2015. I’m so happy that number will change now with these new Dove Hair emojis. Indeed she does, baby. Indeed she does.